Below is a personal essay I wrote back in early 2006 for admission into Seattle University's Master of Sport Administration & Leadership program. I still mean every word. It may sound strange, but I fell in love with Notre Dame all over again last October 15th during the closing moments of a fantastic college football game, as Reggie Bush managed to sneak over that white line, breaking thousands of Irish hearts. You always hear about the Notre Dame family, but at that moment, you would have had to be cold-blooded not to have felt it; that sense of closeness and camaraderie came from the awareness that every single person around you was sharing that exact same feeling of utter devastation topped with a hint of pride, knowing that your classmates down on that field came so close to beating the top-ranked Trojans. 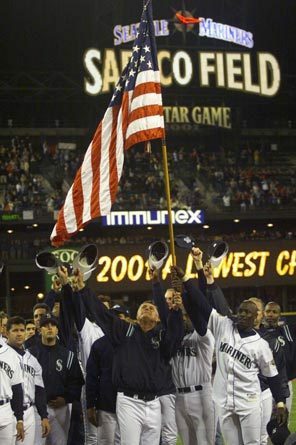 Another memory forever embedded in my mind came in 2001, when the Mariners clinched the division shortly after the tragedy of September 11th. 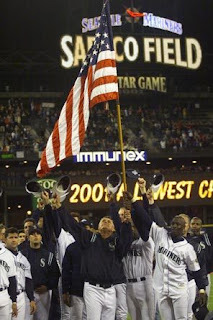 The image of Mike Cameron and Mark McLemore proudly carrying the American flag during the team’s subdued celebration, and the heart-wrenching moment of silence that followed, were vivid reminders that while there is more to life than sports, its presence can help life go on. Of course, competitive sport affects society in a variety of ways. In the best of times, sports provide entertainment, whether an individual is an armchair quarterback or an actual quarterback, or somewhere in between. Sports also play a strong role in the business world, as they impact community development and economic fortunes. Having a professional sports franchise brings a degree of prestige to a city, and a new stadium gives the area a chance to be revitalized. Television networks depend greatly on sports as well, as a programming base, promotional vehicle, venue for advertising, image-builder, and community tie-in for local affiliates. However, sports can also become a backdrop for other forces in society, and help people get through painful healing processes. As my examples hopefully illustrated, the most important function of sports is its ability to affect civic and school pride, and how it can help build and inspire entire communities. Its greatest contribution to society is ironically the most observable during the dire times, as it helps us get back up on our feet by becoming a source of distraction, giving us something else to think about. The function sports serve may alter with the times, but there is no denying that they play a vital role in our society.